Star Wars 9 Leak Exposes the Truth Behind Kylo Ren, Darth Vader & Sith Ghosts? We have ourselves one heck of a new rumor regarding Star Wars 9 that involves Kylo Ren and one of the most important characters in the history of the franchise. First off, we must caution that if you want to go into the movie clean as can be next year, it's time to turn away. Also, as always with stuff like this, it needs to be regarded as a rumor for the time being and shouldn't be taken as the word of law. That said, if there's any truth to this, it's pretty crucial. Warning: potential spoilers ahead for Star Wars 9. According to an anonymous leaker in a new report, the upcoming finale to the new trilogy will see Kylo Ren coming face-to-face with none other than Darth Vader. While it won't be in the flesh, since Vader is long since dead, it's reportedly going to be in some sort of Force-fueled nightmare sequence, similar to what Rey experienced in The Force Awakens. And the movie will reportedly reveal the existence of Sith Ghosts. Per this anonymous leaker, here's how the scene plays out. "A description of Kylo Ren inside a medical room. He is walking down a hallways when he hears someone screaming in pain. He walks into another room where he discovers Anakin Skywalker/Darth Vader with his suit on but mask off, pinned to wall where heavy machinery is replacing his old mechanical legs and arms with new ones. Ben walks closer to the Darth Vader figure in pain and examines his burns before a piece of machinery swings behind Kylo that eventually puts on the mask of Darth Vader. Kylo Ren turns around and exits the rooms and wakes from his sleep in his chambers almost mirroring the nightmare Anakin had in Revenge of the Sith." That is a lot to process. Beyond the surface level implications of seeing Darth Vader yet again on screen, with his mask off no less, this would be a crucial sequence. Kylo Ren, aka Ben Solo, has pretty much molded his whole career after his famously evil grandfather. It would surely do a lot to his psyche, and thematically for the story, if he finally were to stare the man down, especially in a manner such as this. Kylo idolizes Vader, but this would show that his life was pain. Far from glorious, like Kylo seems to think. This would also possibly open the door for Hayden Christensen to come back to the franchise for the first time since Revenge of the Sith. That may make some fans cringe, but it would also offer a chance at redemption. After all, it's been teased that J.J. Abrams is looking to unite the entire franchise, prequels and all, with this movie. That would be one way to go about it. 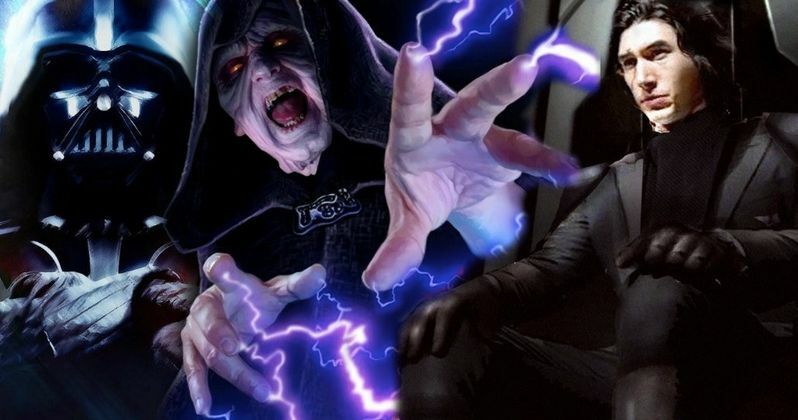 There's also the whole rumor we reported on recently about Emperor Palpatine possibly reappearing as well. Assuming both things actually happen? That's a lot to take in. For now, it's all hearsay until Lucasfilm starts confirming some details. And that may not happen for some time. We'll have to see what J.J. Abrams, who's back in the director's chair after handing things over to Rian Johnson for The Last Jedi, has in store. The returning cast includes Daisy Ridley, Adam Driver, John Boyega, Oscar Isaac, Lupita Nyong'o, Domhnall Gleeson, Anthony Daniels, Kelly Marie Tran, Joonas Suotamo, Billie Lourd and Mark Hamill. New cast members include Naomi Ackie, Richard E. Grant, Keri Russell, Matt Smith and Dominic Monaghan. Billy Dee Williams is also set to return as Lando Calrissian, with Carrie Fisher coming back as Leia once more, via unused footage from the previous two installments. Star Wars Episode IX is set to arrive in theaters on December 20, 2019. This was first reported by Express.